A group of miscellaneous people wakes up in a locked and barricaded apartment. Before they can do anything, the deadly game of the Jigsaw killer starts. 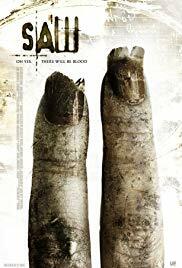 This first sequel of the classic splatter film Saw sees a chance in director and gives the directing part to Darren Lynn Bousman who will also make Saw III and IV. If the film was to follow the logic of the overall series, namely that the more it goes on, the less good they are, it should then be the second best, but because the third one is actually better, this one is then the third best (follow me? Huh). The strength of this second opus is clearly the traps. They are really elaborated and give the audience the guilty but great pleasure of watching the characters getting killed one after the others. My gold medal would go to the needle swimming pool trap, which still horripilates me everytime I recall it. However, the element of surprise that made the success of the first Saw is gone here. It is just the same thing except bigger, and that really minimizes the film’s interest. Actually, if it wouldn’t be for the cool ending, the scenario would be really basic and boring. Still, those who liked the first one should enjoy that one just fine.